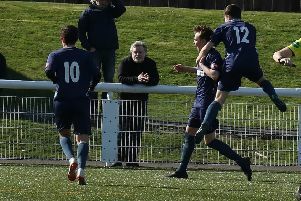 Lochar Thistle sealed their place in the third round of the Southern Counties Challenge Cup after a 7-1 dismantling of St Cuthbert Wanderers last Saturday. Iain Anderson scored a hat-trick, Craig Muir netted a double and Michael McGauchie and Ryan Coates were also on the scoresheet. Blair Dougan’s effort was little more than a consolation for the visitors. Also through to the third round are Bonnyton Thistle who beat Lowland League side Edusport Academy 1-0 courtesy of a Kristopher Kerr effort. Mid Annandale edged a seven-goal thriller against Stranraer youngsters at New King Edward Park. A winner from player-manager Paddy Flannery with 15 minutes remaining gave the hosts a 4-3 victory. There were also big wins for Abbey Vale and Lochmaben against Upper Annandale and Wigtown & Bladnoch respectively. Searus Aynsley had given Upper Annandale the lead but Vale came back strong with goals from Keiran Pirrie, Lee Malin, Dylan Cairnie and Brodie Turner in a win 4-1. Lochmaben thumped Wigtown & Bladnoch with Cameron Thorburn striking twice in a 5-1 victory. The league match between Newton Stewart and Queen of the South was abandoned with the score at 1-1 after full-time because of icy conditions. Tomorrow’s (Saturday) fixtures (3pm unless stated) Creetown v Upper Annandale (2pm), Lochar Thistle v Bonnyton Thistle (2pm), Nithsdale Wanderers v Lochmaben (2pm), Mid Annandale v Abbey Vale, Newton Stewart v Heston Rovers, St Cuthbert Wanderers v Annan Athletic, Threave Rovers v Stranraer.